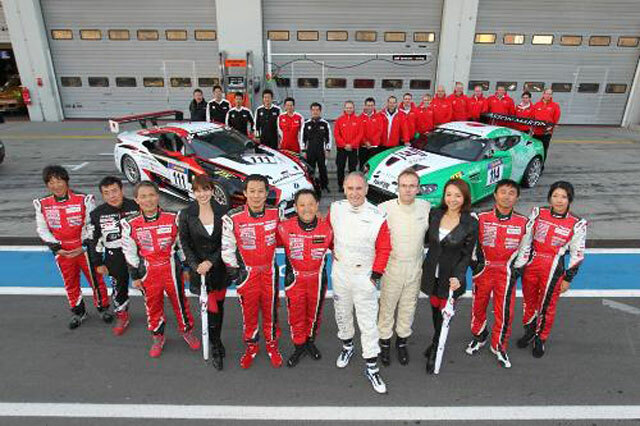 “As I learnt that our teams would share a garage once again I renewed my invitation to Akio Toyoda to drive an Aston Martin race car and I was delighted to accept his offer in return”, said Dr. Bez. “We have raced side by side regularly since the 2008 24 hour race here at the Nurburgring. Since then a personal friendship has developed into this decision to experience each other’s race cars. Other company bosses meet on the golf course, we race together”, commented Dr. Bez, who since 2006 has regularly competed in races on the Nordschleife. Aston Martin V12 Zagato Zig (#114) and the Lexus LF-A (#111) both competed in the SP8 class. For the Aston Martin, however, this race was to become highly dramatic. Unfortunately Zig was hit by another car out on the track and damaged so badly that it had to return to the pit garage for a longer period of time and a dropout of the race was imminent. Working feverishly the engineers were able to make a repair so that the car could return to the track. Both the Aston Martin V12 Zagato and the Lexus LF-A crossed the finish line in tandem, with Ulrich Bez driving the Lexus and Akio Toyoda driving the Aston Martin. Considering the symbolism of the cars finishing the race side-by-side, this joint racing effort looks like a momentous occasion for both companies — to the point where you have to wonder if there’s more to the team-up than just racing. Take the fact that Aston Martin & Mercedes were once talking about a significant partnership that would see AM get access to Mercedes engines, platforms & technology in exchange for building the next-generation Maybach — a deal that has reportedly collapsed — and you can start to see all sorts of possibilities between Lexus & Aston Martin. Not only that, the Toyota IQ-derived Aston Martin Cygnet has shown the two companies can work together. That’s certainly enough to get my gears turning (especially when the Aston Martin Rapide is probably my favorite non-Lexus out there). Lexus obviously has the engines & technology that Aston Martin is looking for, but what could Aston Martin provide in return? Perhaps an ultra-luxury sedan to compete with Maybach & Rolls Royce, or a foor-door coupe like the Rapide? Erich Kerner: Toyota should aquire both companies (Aston Martinand Lotus)...there is nothing more too say about it.